Paper Crafts by Candace: Let's Stick Together! Facebook Sticker Hop! Hi there! Welcome to the Facebook Sticker Blog Hop! We all use these adorable little stickers in our Facebook messages to one another, so we thought what a GREAT IDEA for a hop! 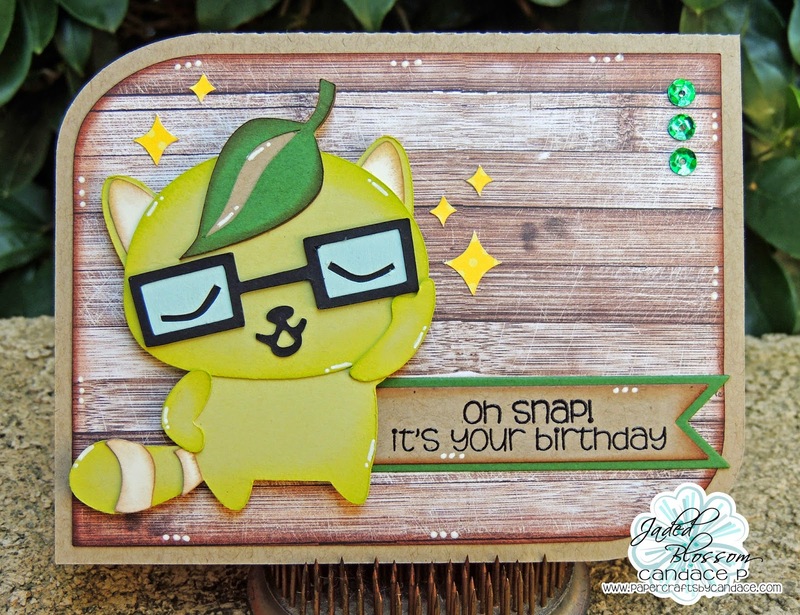 Our blog hop is sponsored by Jaded Blossom and SVG Cutting Files, so sit back, relax and enjoy the wonderful creations the teams have made using some of their favorite FB Stickers! Now if you came here from Michelles Blog then you are in the right spot. If not, you will want to start at the beginning with Michelle. How cute is this Raccoon? I love the leaf on his head and his glasses so I had to make him! For my card I used a card base from SVG Cutting Files! The sentiment is from Jaded Blossom's "Happy Summer" and I stamped it on the Flag Die. Here is a close up of my cute guy! To request your files, you MUST complete the blog hop, and read the posts, as ONE of the blog posts will redirect you on how and where to submit to get the free files. Free File Request ENDS PROMPTLY at 11:59 PST TONIGHT, April 4, 2014. OMG that is the cutest expression! LOVE IT! Adorable Candace, loving the hop so far! Oh my! He must ave the cutest expression ever. His expression is so versatile to say so many things. Utterly adorable and I agree, his leaf is too cute! I love this and will be using this for a belated birthday! love this sticker collection..use it all the time on fb..cute on a card..
Too too cute. Love him and especially the glasses and leaf on his head. Love the glasses! So adorable! I love your sweet raccoon! his expression is priceless. LOVE IT ALL ~ The raccoon, the sentiment, the project!! You are SO CLEVER!! Love it that you didn't use traditional colors for the raccoon!!! I never realized how cute these things were!! Super cute! Love your card. Love the little racoon, the sentiment is perfect withe the card! SUPER cute!! Love that cat! He's a cutie! Great card! Very nice & I love the background paper! This little guys expression is so fun! A great project! Awe… so cute!! Love the yellow!! He is soooo cute!! Love it! Love the glasses, very cute card! lol adorable, love the glasses!!! I love racoons! Great Job! awww...what a cute little guy! Love the sentiment and great background paper. What a fun card! Oh such a cutie. Great job!! Love that Raccoon!!!! So stinkin' cute. How cute is this little guy? Extremely! So cute! I love his square glasses and the sparkly diamonds around him! Love this little guy!! Thx, I am a follower now! I love the colors used!!! I love it. Such a cute file!!! Cute raccoon! Especially love the glasses. Such a creative idea for a hop. Quality projects as Usual! Thank you so much for sharing your talent! That little cat is adorable! Love your card! very cute and love his little glasses! He is a very cute guy. Thanks. Ha, ha, ha So cute!! So cute, you did a great job. Love the raccoon - so cute! 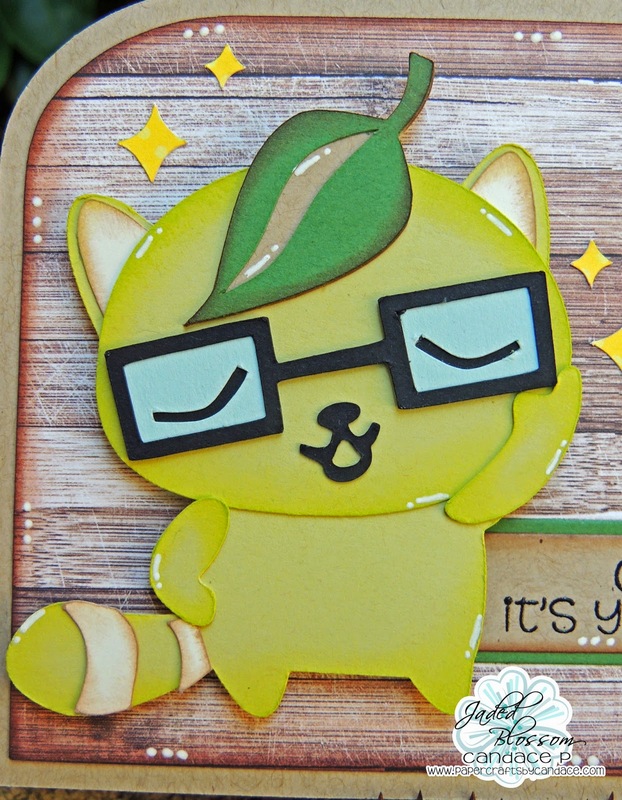 Thanks for the blog train> Love the raccoon! Very cute...just love the raccoon! Great card!! Thank you for sharing. Love the raccoon!! too cute!! How cute. Thanks for sharing. Love that leaf on his head!!! I love him he's so cute. Gosh, What a cute litte guy, I love his glasses and the paper you used as a background, the flag die is very useful too, thanks a lot! I love him. Just so cute! She is so sweet, I love the glasses! Perfect stamp for such a sassy sticker. Love it! Great way to see some of the stickers for those of us who don't really use them. So cute. Love the hop so far! This is soo cute! So cute! Love it! Thanks for the hop! so cute! Did you make the 'wood' or is that a stamp or paper? He is perfect. I love his attitude. Absolutely love this card. He (or she LOL) is too cute. Love the white accents too. A yellow raccoon!! Why not! You gave him great life. I will be making a birthday card with this one, for sure. But it will a useful file for many different occasions. Thank You! So cute! That little character is adorable and goes wonderfully with the fun sentiment too! This little guys is soo cute!! And I LOVE that background paper! Fabulous job!! Nice card may be using this, thanks! How cute! The sentiment fits so perfectly with the raccoon! Thanks for sharing! I totally agree that the glasses are so cool! Cute! He is a cute guy!